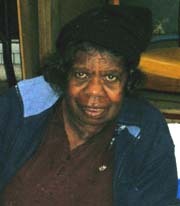 Mitjili was born circa 1945 at Haasts Bluff, Central Australia. Mitjili is a Pintupi woman from the Ikuntji (Haasts Bluff) region in the Northern Territory. Since commencing painting in 1993 at the Ikuntji Womens Centre, Mitjili Napurrula has developed a reputation as one of the most innovative of the contemporary Central Desert painters. Her canvases are patterned with strong, vibrant colours, and contain an incredible energy. Mitjili is a Pintupi woman from the Ikuntji (Haasts Bluff) region in the Northern Territory. Since commencing painting in 1993 at the Ikuntji Womens Centre, Mitjili Napurrula has developed a reputation as one of the most innovative of the contemporary Central Desert painters. Her canvases are patterned with strong, vibrant colours, and contain an incredible energy. The image that is painted is a representation of trees that provide the wood for the making of spears and other wooden objects. The country where the trees are found is Uwalki, Mitjili’s fathers country. Mitjili was taught her fathers dreaming by her mother, who drew images of Uwalki, (also the name of the trees that traditionally provide wood for spears) in the sand. Mitjili’s distinctive style has gained her a strong following within Australia and internationally with regular sellout exhibitions. Mitjili Napurrula sometimes collaborates with her husband, celebrated painter Long Tom Tjapanangka, winner of the prestigious Telstra Aboriginal and Torres Strait Islander Art Award 1999. Exhibitions: 1993, 1994,1996,1998 Australian Heritage Art Award, Canberra; 1994,1997,1998,1999 Araluen Arts Centre, Alice Springs; 1994 Gallery Gabrielle Pizzi, Melbourne; 1994 Hotel Shangri-la and Australian High Commission, Singapore; 1994, 1998 Adelaide Fringe Festival; 1994 Art Gallery of NSW, Sydney; 1995, 1996, 1997, 1998 Museum and Art Gallery of the Northern Territory; 1995 Flinders Lane Gallery, Melbourne; 1995, 1997,1999 Hogarth Galleries, Sydney; 1996 Gallerie Australis Adelaide; 1996 "The Meeting Place" – touring exhibition, Australia; 1996,1998,2000 Niagara Galleries, Melbourne; 1997,1999,2000,2002 Aboriginal Art Galerie Bahr, Speyer, Germany; 1997 Goteborgs Konstforening, Goteborg, Sweden; 1997 Arnhem, The Netherlands; 1997 Alliance Francaise, Canberra; 1998 Art Gallery, Rotterdam, The Netherlands; 1998 Spazio Pitti Arte Florence, Italy; 1998 Framed Gallery, Darwin; 1998 Gallerie Dusseldorf, Perth; 1998 Gallery Gondwana, Alice Springs; 1998 Ian Potter Museum of Art, University of Melbourne; 1998 Niagara Galleris, Melbourne; 1999 Flinders Art Museum Flinders University, Adelaide; 1999 Fine Arts Museums of San Francisco, USA; 2000 Art Gallery of South Australia, Adelaide; 2001 Galerie Knud Grothe, Charlottenlund, Denmark. Solo Exhibitions: 2000 Niagara Galleries, Melbourne 1998 Niagara Galleries, Melbourne 1997 Niagara Galleries, Melbourne 1996 Niagara Galleries, MelbourneCollections: Art Gallery of New South Wales Artbank, Baillieu Myer, de Young Museum, San Fransisco, USA. Flinders University, SA. Campbelltown Regional Gallery, NSW. Latrobe University, Vic. Mornington Peninsula Gallery, Vic. Art Gallery of South Australia, SA. Museum and Art Gallery of the Northern Territory, NT. National Gallery of Victoria, Vic. National Gallery of Australia, ACT Art Gallery of Western Australia, WA. Private collections, Australia & overseas. Awards: 1997, finalist 14th Telstra NATSIAA; 1999 Alice Prize (Central Australian Art Award), Alice Springs.